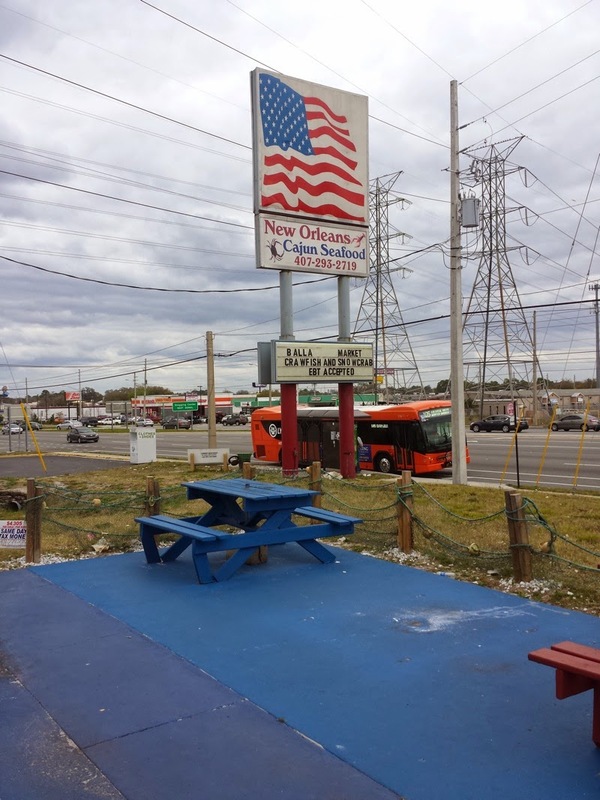 New Orleans Cajun Seafood is located in Pine Hills, near the intersection of 50 and Kirkman. They are in a small building that appears to have once been another sort of fast food restaurant, perhaps a Captain D's. 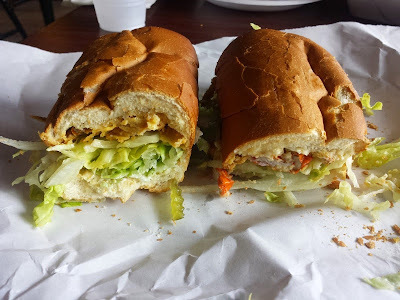 If this is what once occupied the building, New Orleans Cajun Seafood is a huge improvement! I had a pound of crawfish on one visit, smothered in cajun garlic butter. Of the crawfish I've had in the Orlando area, New Orleans Cajun Seafood seems to use the most potent flavoring. The crawfish are completely overloaded with garlic and the cajun spices give them a nice spicy kick. 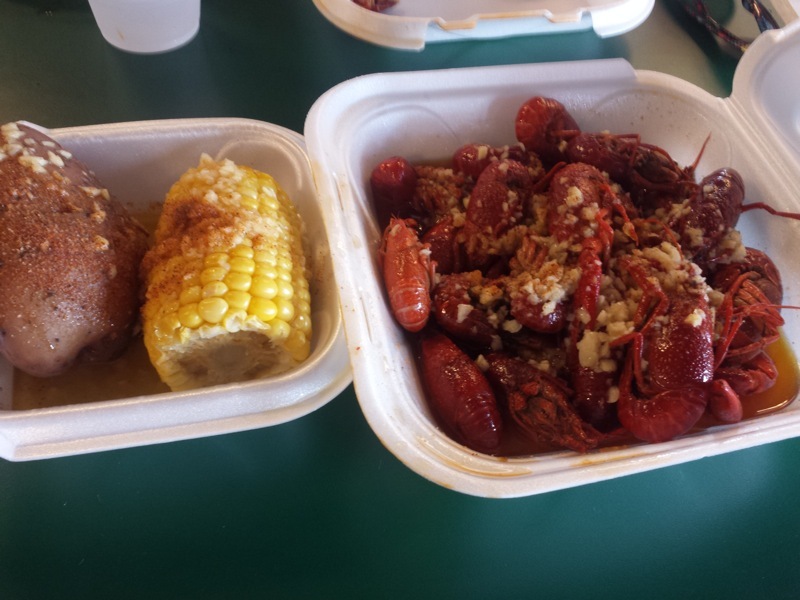 I also had a side of corn and potato, also covered in the same seasoning as the crawfish. Using the potato to soak up even more crawfish juice made it even tastier. 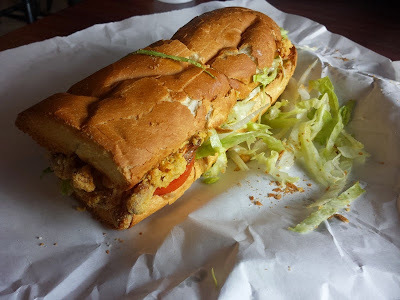 I tried the Soft Shell Crab Po-boy on another visit. Served on a baguette, this sandwich was filled with the deep fried soft shell crab, lettuce, tomato, pickles, and sauce. The sandwich was good, although the soft shell crab did seem slightly past season with the shell being a bit too hard in a couple spots. It was still mostly good besides the occasional hard part that I spit out. Asparagus Fries were crispy thin asparagus with tarragon and a citrus aioli. J.T. 's Kettle Chips was a tasty mound of crispy potato chips topped with gorgonzola cheese, bacon, Roma tomato, and scallions. Shrimp and Crab Nacho Plate. These overloaded nachos were piled high with rock shrimp, crab, pepper jack cheese and fresh jalapeno. I heard comments from others at the table that these were spicy, but these nachos were pretty mild to me. Perhaps I got a nacho with a weak jalapeno. Grilled Chicken Stack. This dish featured Grilled Prestige Farms Chicken, Squash “Carbonara,” Apple-Wood Smoked Bacon, Sautéed Spinach, Fines Herbs, Parmesan, Sun-Dried Tomato Sauce and Parslied Olive. Tavern Burger was a classic burger, topped with lettuce and tomato. Fries were served on the side. Shrimp and Grits consisted of a white cheddar grit cake, spinach, Roma tomato, shallot, and Roast Tomato Beurre Blanc. Since my very first visit to a Marlow's Tavern location, their Shrimp and Grits has been my favorite thing I've tried on their menu. Classic Creme Brulee was house-made with Madagascar Vanilla Bean and Crispy Sweet Crust. During a return drive from Tampa to Orlando, I made a pit stop for lunch at a restaurant called Reunion Cafe. Technically, I guess the restaurant is located within Reunion based on the name, but I was always under the impression that Reunion was more of a golf resort than an actual town. Wikipedia says Reunion is located within Four Corners (another non-town? ), so I suppose it's not an actual city? I'm still not sure, besides the fact that I had a tasty lunch at a restaurant with Reunion in the name. 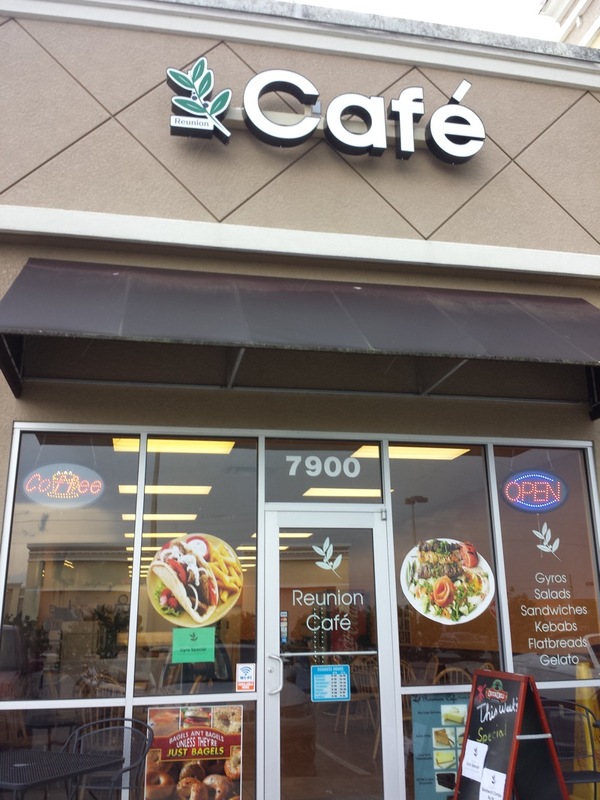 Reunion Cafe sold all sorts of Middle Eastern food. I went for their Gyro Combo, which included a gyro pita, French fries, and a beverage. The pita was filled with lots of lamb. It was slightly spicy and had lots of flavor. Lettuce, tomato, onions, green peppers, and a creamy mayonnaise-like sauce finished it off. The fries were okay, but nothing to write home about. A pickle was also served on the side. 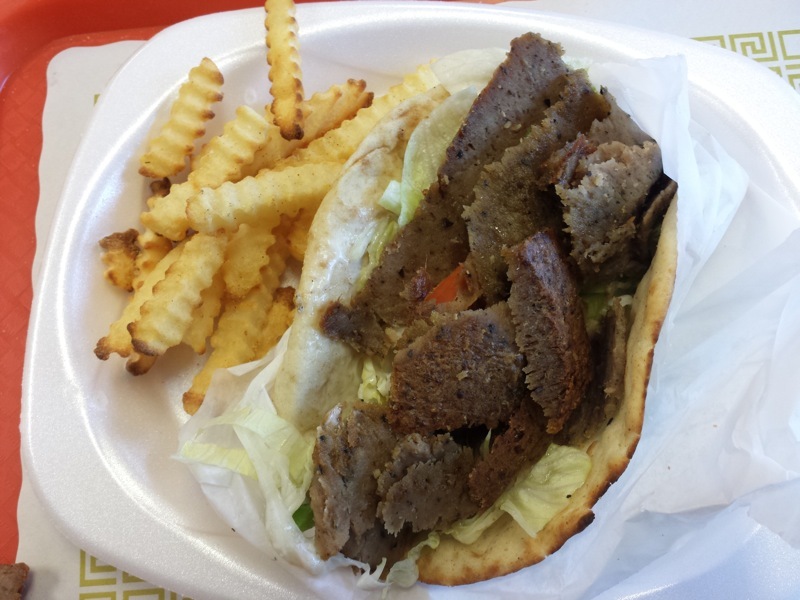 Reunion Cafe had a tasty gyro. They are far from home for me, so I don't think I'd return soon, but might stop in again on a drive to or from Tampa. I tried an Italian buffet on International Drive called Oreganatta. They are located in a new building near Wet n' Wild. There was another Italian buffet nearby on International Drive several years ago that was above average. They ended up closing and a CiCi's Pizza took over the space. 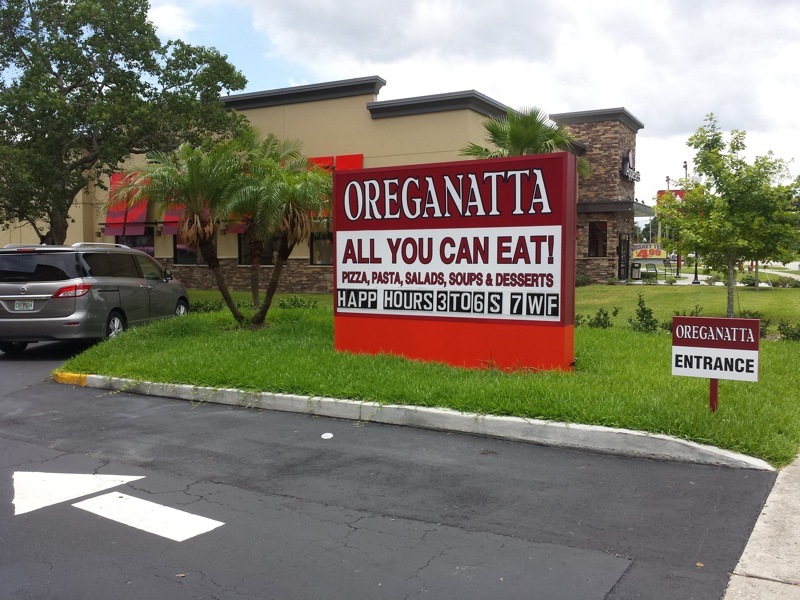 Perhaps my memory of this long gone buffet gave me hopes for Oreganatta that were slightly too high. Oreganatta was almost completely empty except for another couple eating there. That's a bad sign for a buffet, but it was still early for the lunch hour so I gave them the benefit of the doubt. I started out by trying their pasta. 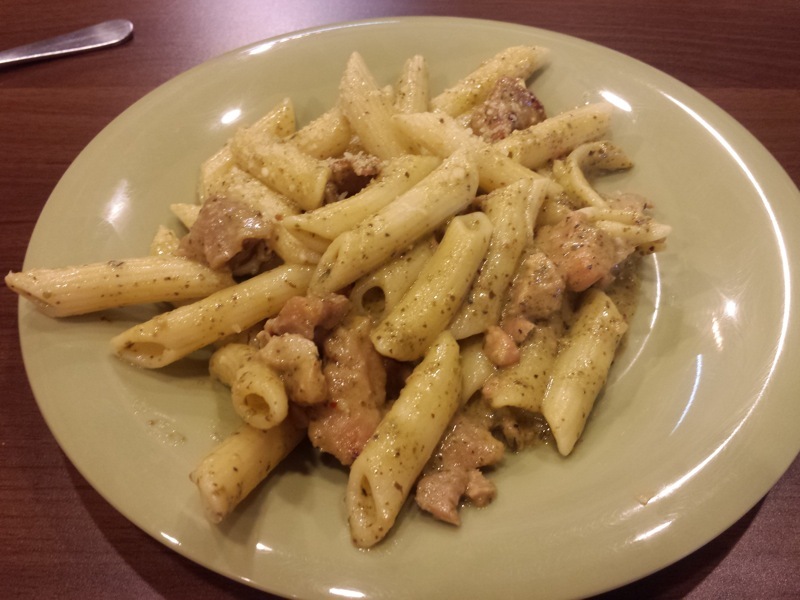 The pasta was custom made by a cook where you picked out sauce, type of pasta, and a choice of BBQ or spicy chicken. I had penne with pesto and spicy chicken. The pesto was okay. The chicken had a weird, slimy consistency and I didn't eat most of the meat. The option to add vegetables into the pasta as well would have been a big improvement. I tried some of Oreganatta's salads next. 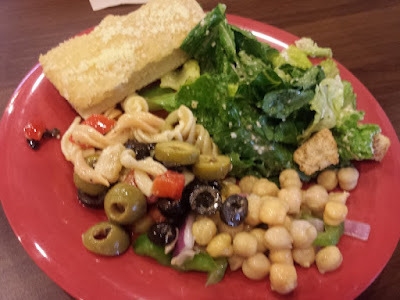 I had some Caesar salad, pasta salad, and a chickpea salad. No complaints here. The salads were the best tasting food I found on the buffet. 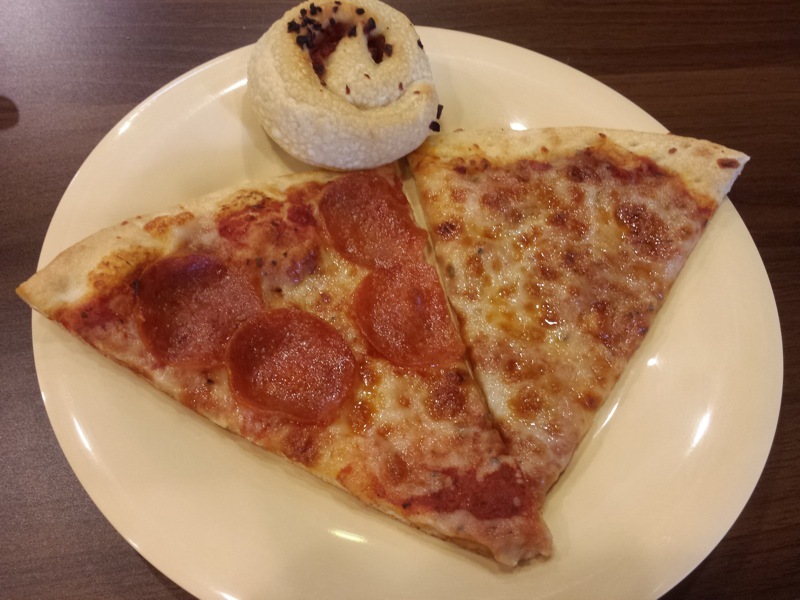 The pizza was similar to what could be found at CiCi's, only without the big selection of pies. It was cheap conveyor belt pizza. There was a cheese and pepperoni pie on the buffet table. One of the employees offered to make another with my choice of toppings, but I passed. 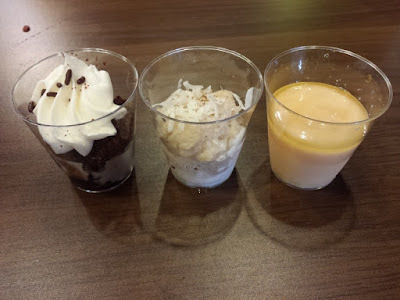 They had lots of mini dessert cups on the buffet as well. I tried some sort of chocolate dessert, rice pudding, and a custard. I liked the rice pudding the best, but the desserts were mostly forgettable. Today is National Doughnut Day. That means you get doughnut deals at the various doughnut chains today. Krispy Kreme seems to be doing the best National Doughnut Day offer where you get your choice of a free doughnut. 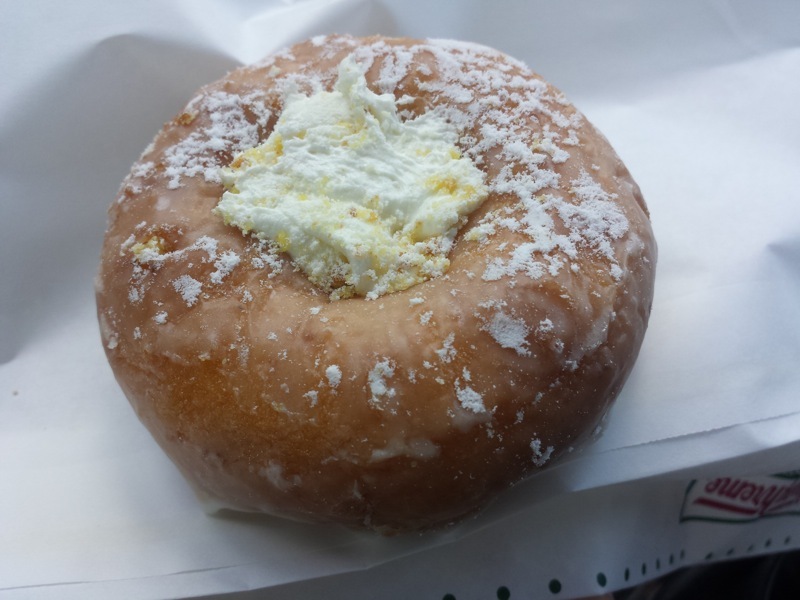 I went to Krispy Kreme near Millenia and got a Lemon Kreme Cake Doughnut. They describe it as a lemon flavored cake doughnut with a rosette of lemon-infused Kreme filling in the center, topped with cake crumbles and powdered sugar. You can also get your free doughnuts from Dunkin Donuts. You still get a free donut, but you need to buy a beverage. Not nearly as good of a doughnut deal, but Dunkin Donuts are much more prevalent in Central Florida compared to Krispy Kremes.